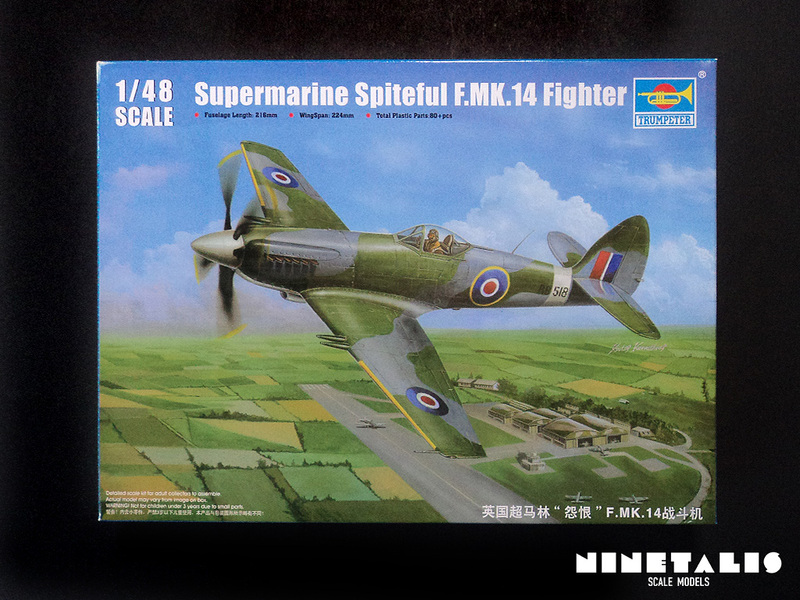 The Supermarine Spiteful is probably most known for being the failed successor of the Spitfire. 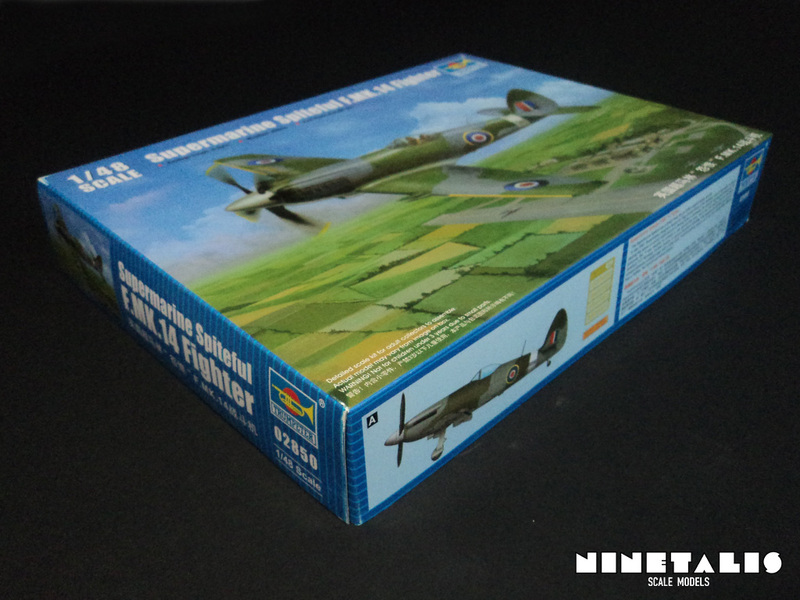 It started life as a new version of the Spitfire, and was build using the famous Rolls-Royce Griffon engine, a wider undercarriage and a new type of laminar wings based on a paper on compressibility, published by A D Young of the R.A.E, with a fuselage based on that of the Spitfire Mk. XIV. Although it offered better overall performance than contemporary Spitfires, the wing displayed some undesirable behaviour at the stall which Supermarine wished to fix before production. An updated design incorporated a new fuselage and now the aircraft differed so much from the Spitfire that they named it Spiteful. The Mk. 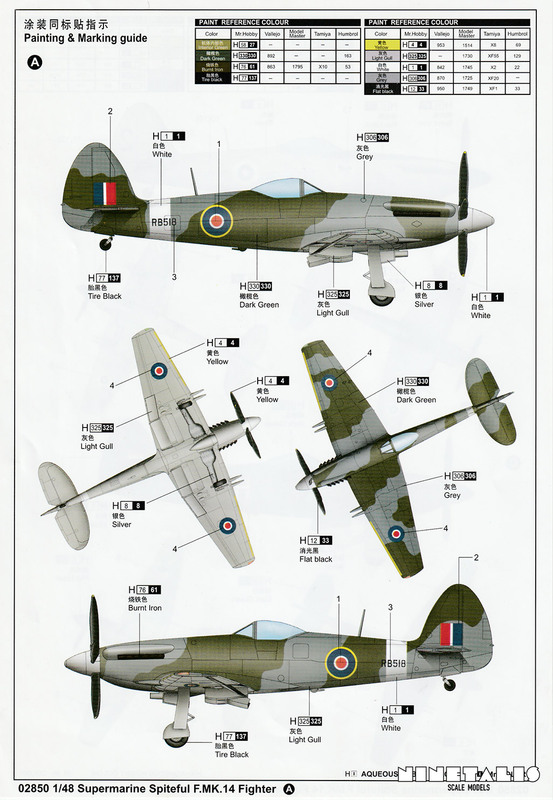 XIV was in fact the first production variant, as the number continued that of the Spitfire variants. 150 airframes were ordered at first, but with the rise of the jet age, the order was cancelled with only a good dozen airframes build. The plane did continue with a new version called the Seafang, which is a naval variant intended to operate from Royal Navy Carriers and compare against future carrier jet aircraft. When the de Havilland Sea Vampire made its appearance, the need for the Seafang disappeared. 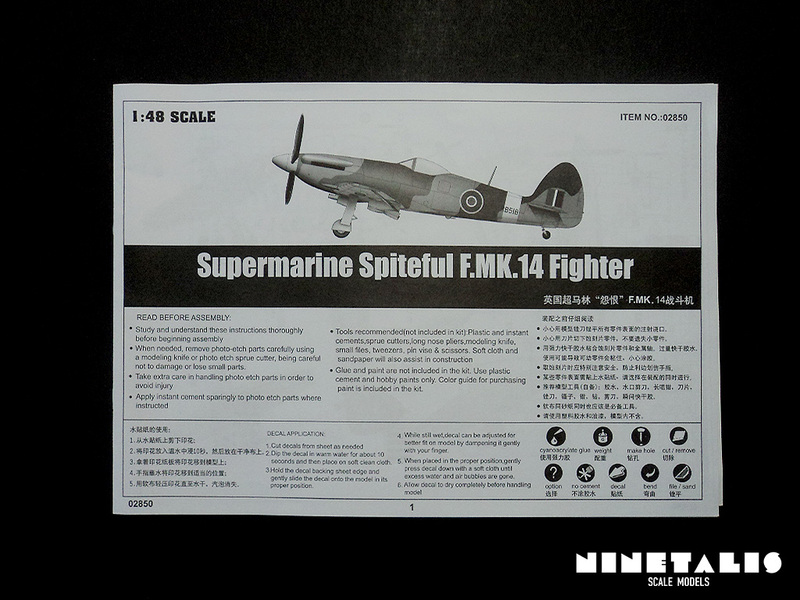 Finally, a jet version of the Spiteful was constructed using the Nene engine, known as the Supermarine Attacker and used by the Fleet Air Arm. Information partially based on that found at WIKIPEDIA, 8 JAN 2016. Trumpeter has this odd tendency when it comes to its British aviation subjects. Unlike their other kits, they are quite straightforward and feature a minimum amount of parts, especially with the cockpit. However, this does not have to be interpreted in total bad way, maybe even to the contrary. 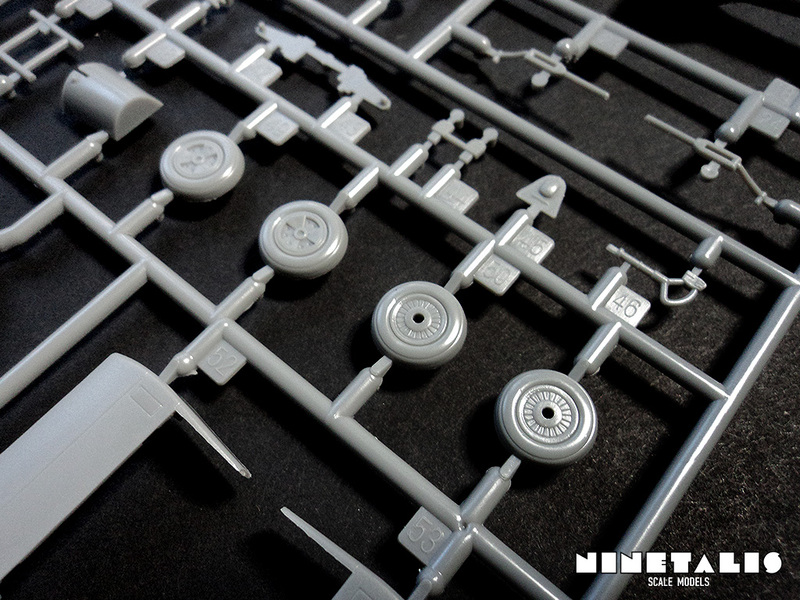 It means that with minimal effort, one can put together a detailed kit with just a little amount of effort. For those that might be worried, don’t be. 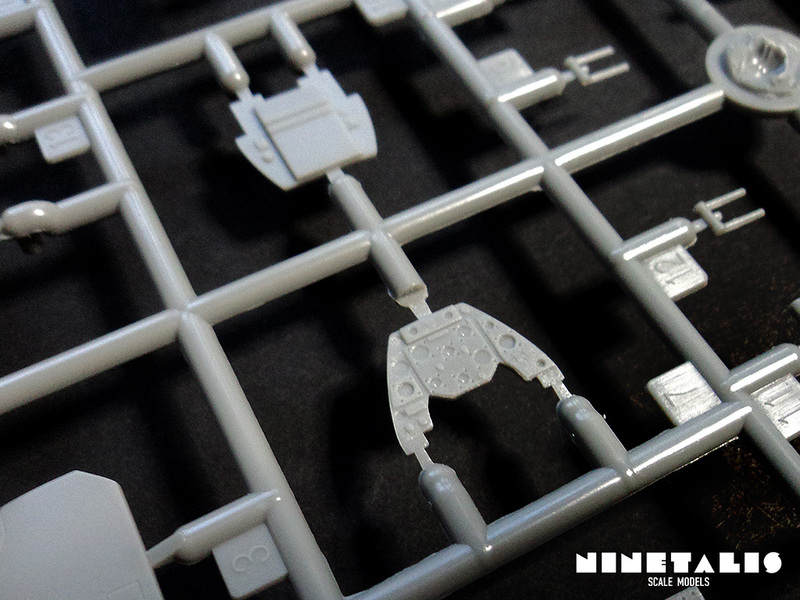 The parts are still very detailed with recessed panel lines and the overall fit is quite great, as I’ve noticed when putting together the kit. 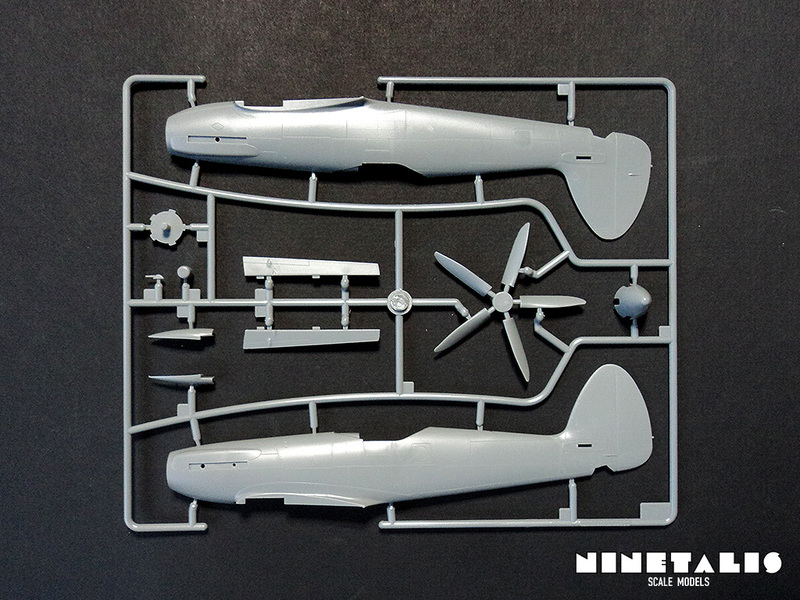 The first sprue features both fuselage halves, ailerons, intake cover and the propellor and spinner parts. 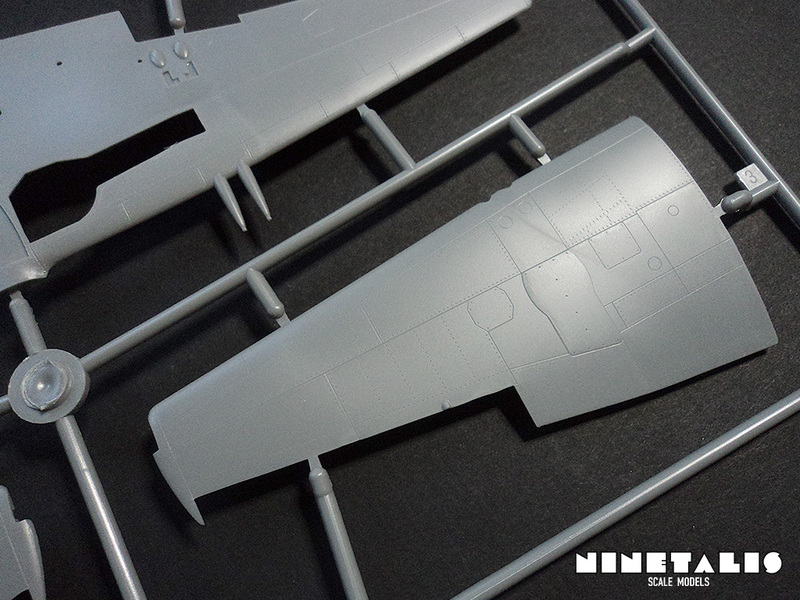 The ailerons and fuselage halves feature fine recessed panel lines as well as recessed rivet marks. 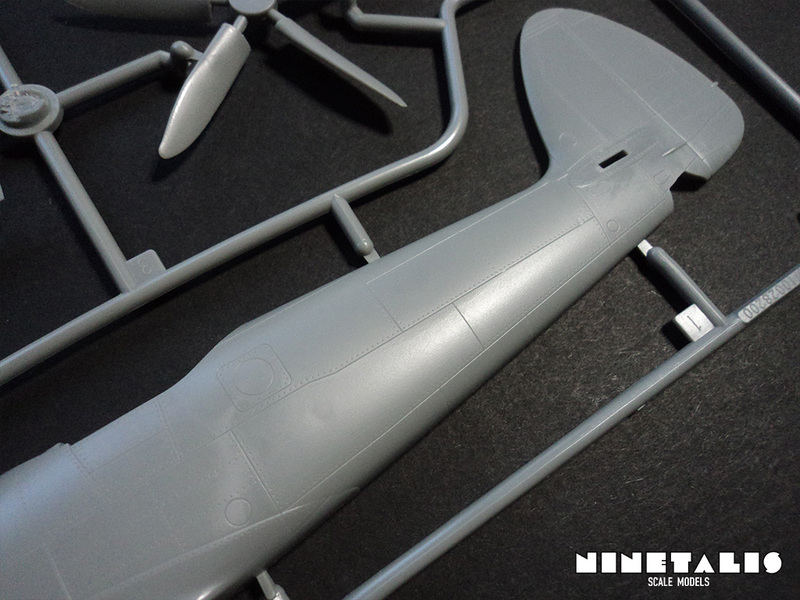 The only downside here are the sprue attachment points on the fuselage halves, as they are rather thick at certain places and need a steady hand to remove from the parts without leaving marks. Same goes for the propellor, as the attachment point are placed on the blades instead of the center point, which would be hidden underneath the spinner once completed. 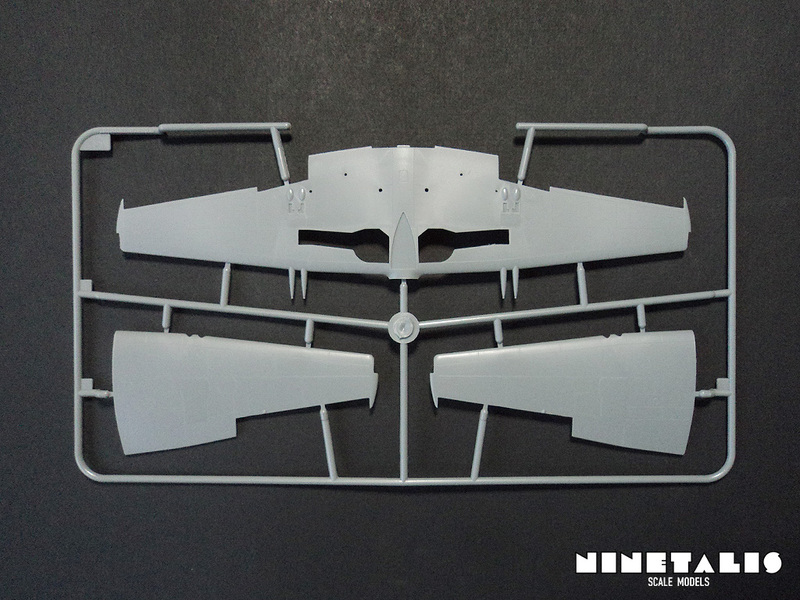 The second sprue features just three parts, which are at he upper and lower wing halves. Like the fuselage halves, it features recessed panel lines and rivets, but also a raised panel which, in real life, gives access to the 20mm Hispano cannons. The wing halves can be put together with easy and leaves almost no seams to deal with. 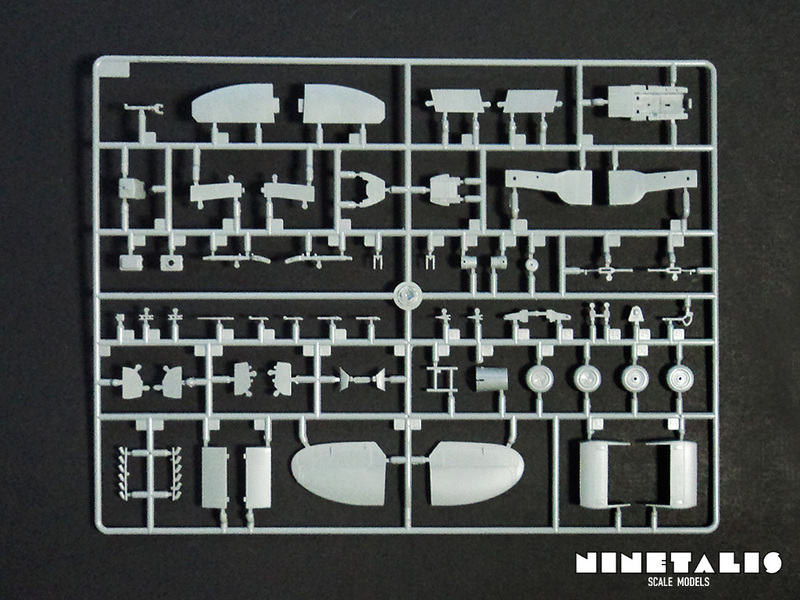 The final styrene sprue holds all the other parts and little fiddly bits, like the instrument panel, landing gear, wheels, wheel wells and their covers, elevators and much more. The cockpit is straightforward and only consists of eight parts. Not to worry, the cockpit is quite obscured by darkness once build. As usual, the instrument panel features recessed and raised features representing the instrument board. The only problem I had with parts from this sprue were the wheel wells, as I had to sand it a little bit on one side to make it fit on the lower wing part. In total we get 7 clear parts, but we don’t need to use them all. 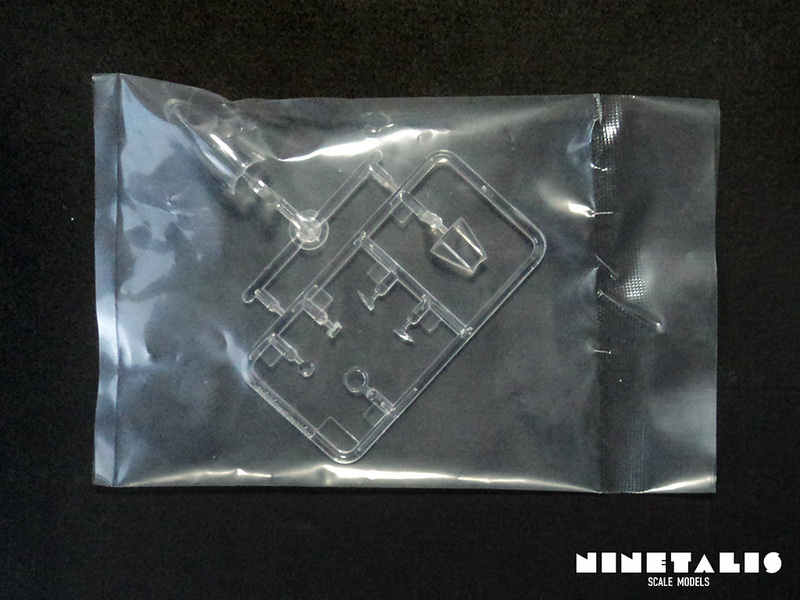 One of the parts represents a window for the instalment of a recon camera. The parts are very clear and show no damage, but do need some sanding here and there on the borders (aka the places you will need to paint anyway). One thing that does prove troublesome is that the sliding canopy part has a seam line smack in the middle of it, which one will have to deal with. 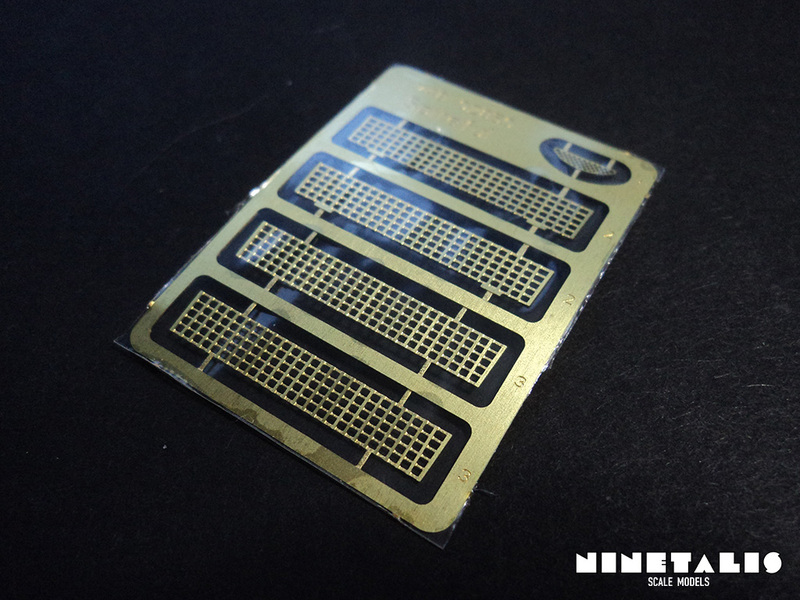 Also included in the kit is a small photo-etch fret. It provided the meshes that can be found on the air intakes underneath the wings. 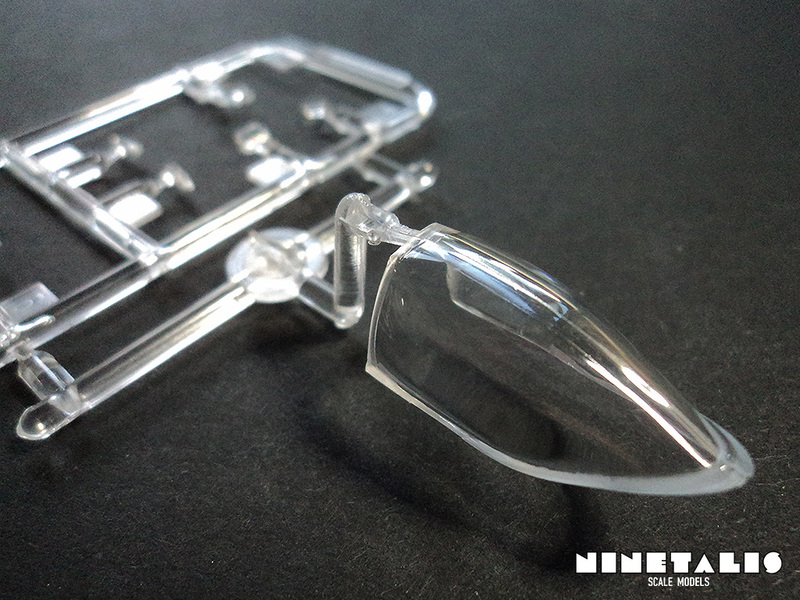 It is nice to see things like this with a cheaper kit, as a see through instead of a plastic part depicting it. There is however one back draw with this very one, as once the rosters are put in place there is nothing in between them, so you can literally see through them. So the builder will need to address this by cutting a small sheet of plastic card and place it between the rosters. The provided instructions sheet is printed on a horizontal sheet of paper. The illustrations are computer generated and should be clear to understand as usual. But despite it clearness Trumpeter seems to have forgotten a few things, literally. The first step for example begins with the cockpit already halfway assembled. This is not a huge problem for an experienced aircraft builder but it is a little odd nonetheless. 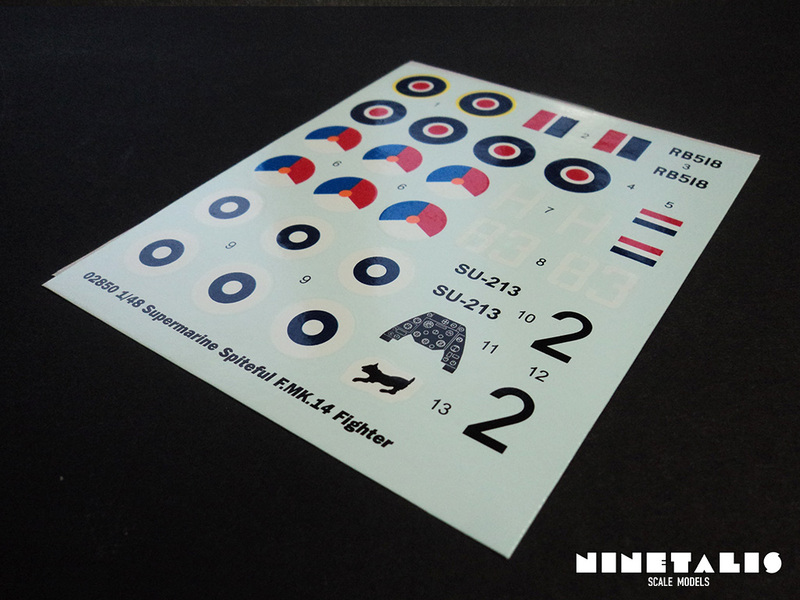 We are provided with a decal sheet containing 32 decals, which consists of national insignia’s and ID numbers. 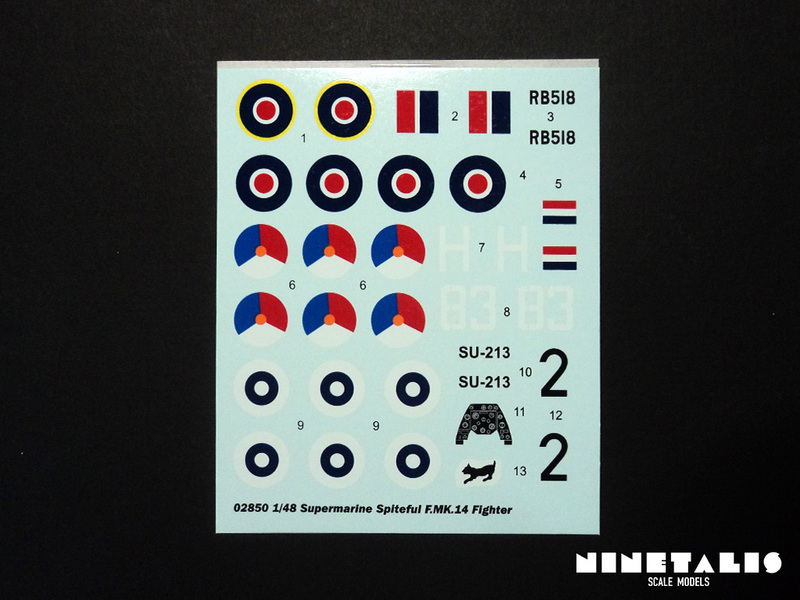 No stencils are included because (judging from photographic evidence) Spiteful airframes did not have many stencils, although a few did have some (as can be seen on the pictures attached to this review). 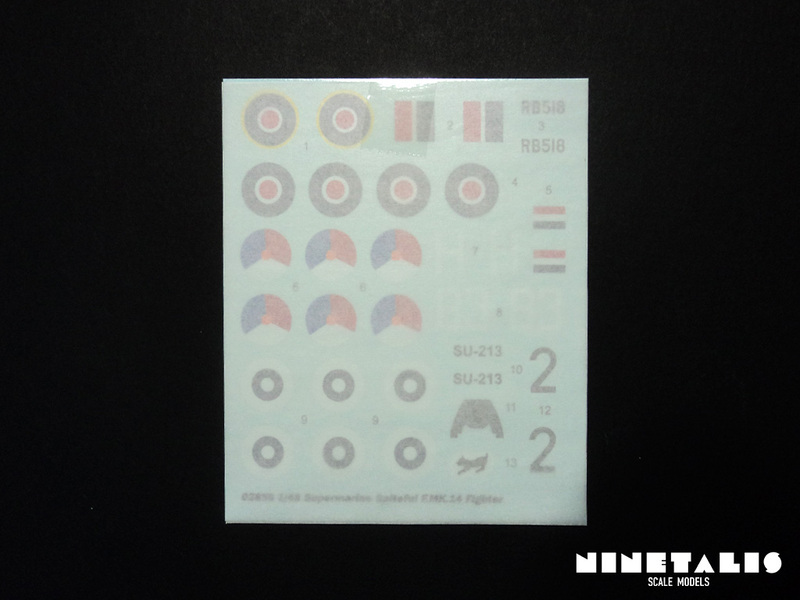 There is a decal for the instrument panel printed in black and white colors, which eyes a bit unrealistic. The decals appear to be of regular Trumpeter quality and seem to suffer a bit from silvering. 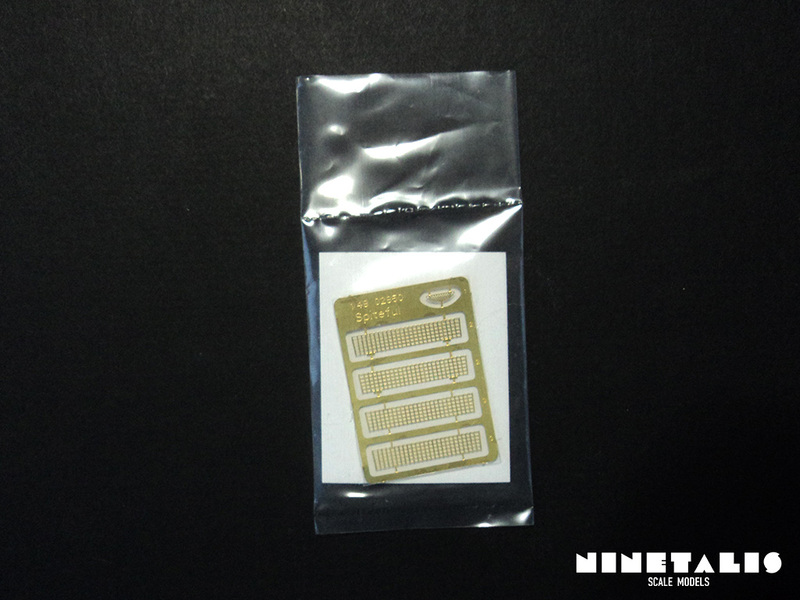 Overlay of the protective layer is small and the decals should not provide any trouble to use. With only a few dozen of these airplanes ever build, the pool of painting schemes to choose from is small. Nonetheless Trumpeter figured out a way to provide us three sets of markings to choose from. The first aircraft is an RAF machine, serial number RB518 (which can be seen on the provided picture below). This airframe was one of the MK XIV’s that was converted to a Mk XVI. Lucky for us, the only change can be found inside, being the Griffon 101 engine instead of the Griffon 69, adding 45 hp and 19 mph, and the aircraft was a Mk XIV at some point. The manufacturer addressed the issue of the few markings by adding several what-if schemes of a Dutch and Finnish airframe, which is nice addition if you are into that. However, the connection to Netherland and especially Finland is quite odd. 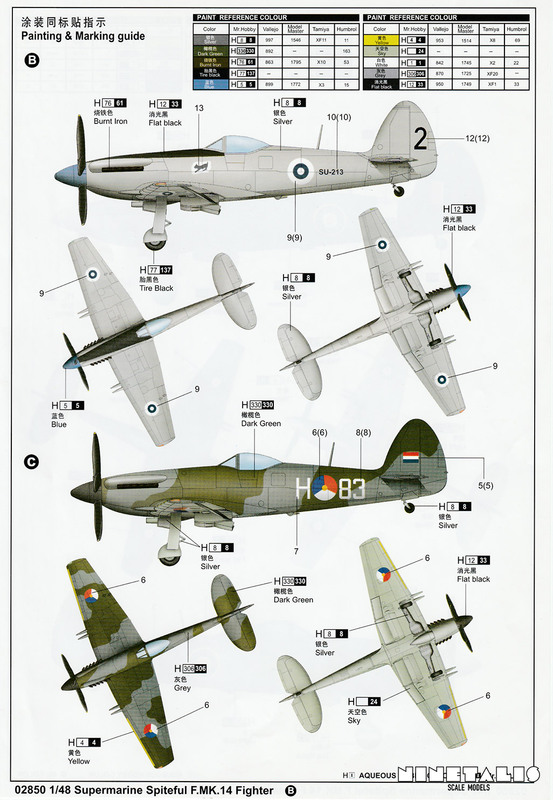 The Dutch did fly a good number of Spitfires after the war but did not show interest in the Spiteful. Finland on the other hand never had a single Spitfire in their arsenal, and to my recollection they never had a single testing or captured airframe either. They did not even have any Supermarine aircraft at all at any time. As a matter of fact, the only party ever to show any interest in the Spiteful was the French manufacturer SNCAN with a licenced production line of Spitefuls in France. Sadly Trumpeter did not exploit that part of historical information. Trumpeter surprises with this little kit of a largely unknown British subject. 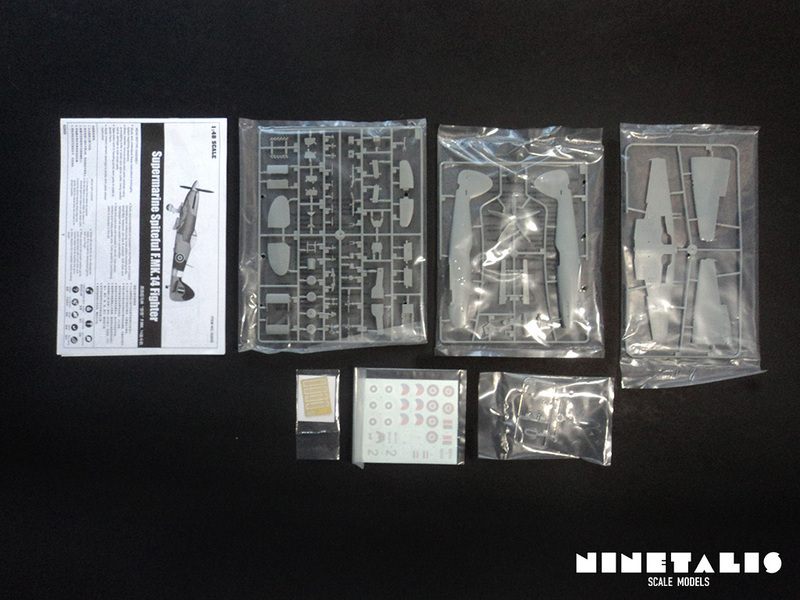 With just a bit short of 90 parts, it is a kit one can build quickly use to learn or train painting camouflages. Trumpeter’s choice to provide a few what-if schemes to build is a nice touch if you are open to those kind of things. Overall fit is quite good but there are some small details where the ball was dropped. At times caution should be used when removing certain sprue attachment points, as they are sometimes a bit thick. Also the fact that there is a seam line in the middle of the sliding canopy part is quite annoying as well and will have to be dealt with accordingly. The cockpit seems a bit too spartan to my personal liking, but can be left as such as the view inside the cockpit is obscured by a lack of light. 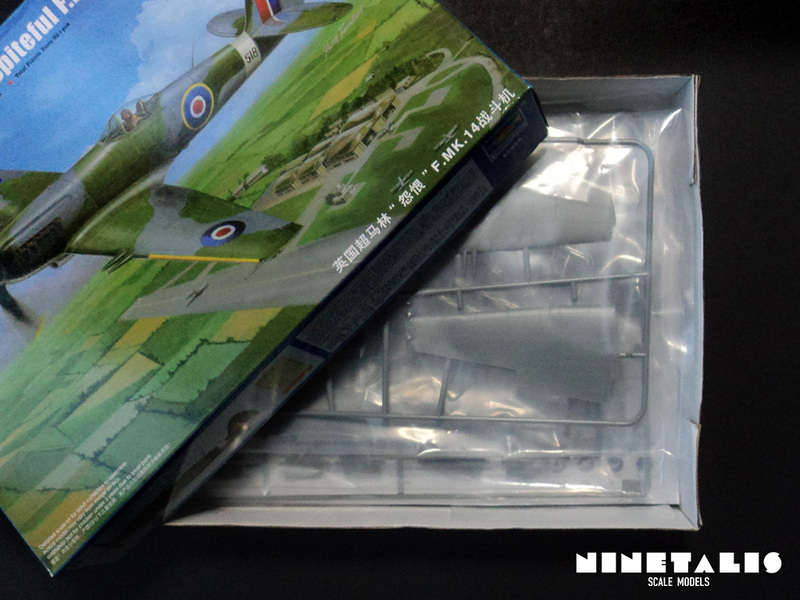 If you are an avid Spitfire builder, this kit is an absolute must to add to the collection, even despite the lack of the legendary elliptical wing on the Spiteful aircraft. People who have a strong liking towards British subjects or obscure aircraft, especially of the WWII time period, should definitely consider it as well. 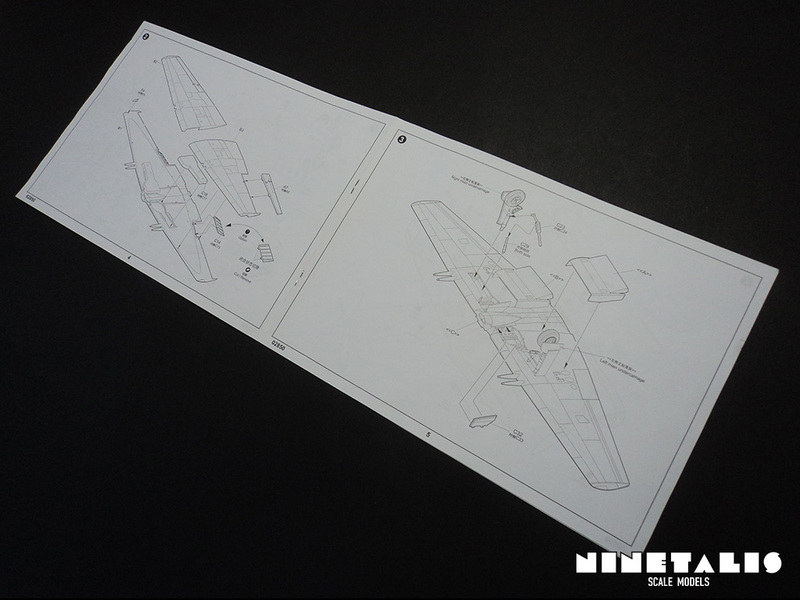 If naval aircraft are more your thing, then get Trumpeter’s later kit of the Seafang, which is in the same price range as this and features two different frames for the fuselage and wings. 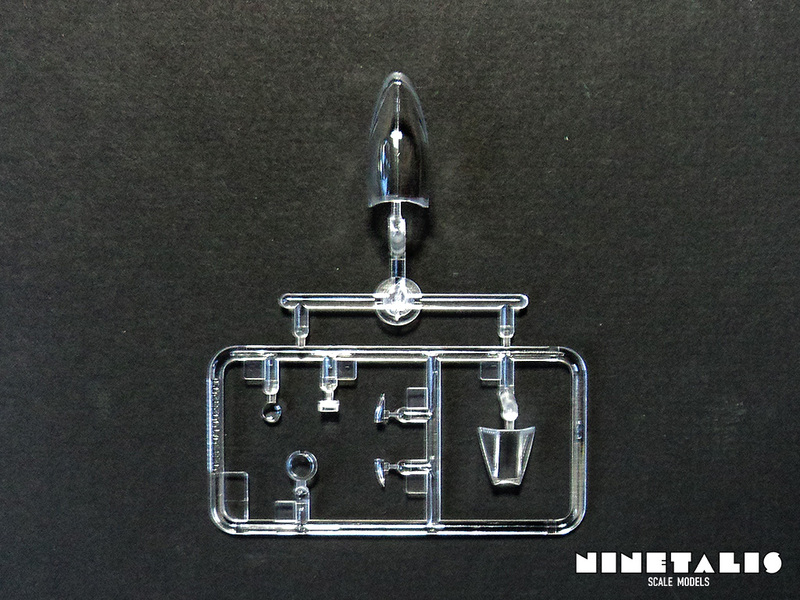 If you’re wondering what this model can be build into, you can click the image below which will take you to the gallery of the completed model build from this kit together with a set of aftermarket decals.